Who doesn’t want clean water? Impeccable water maintenance is a hallmark of Marquis. Forty years of meticulous refinement has yielded the most elegant and efficient water management system on the market. As the name implies, it keeps your spa water constantly clean and ready to enjoy. The ConstantClean™ water management system is like having cruise control for your spa. For up to four to six weeks you can set it and practically forget it. Depending on which Marquis hot tub you select, it comes with either a single-filter or dual-filter configuration. ConstantClean employs a five-stage filtration process to suction, trap and remove contaminants and particulates. Everything from sweat, skin oil and lotion, to skin cells, dirt and grit. SmartClean™ software automatically schedules a cleanup cycle after each hydrotherapy session. 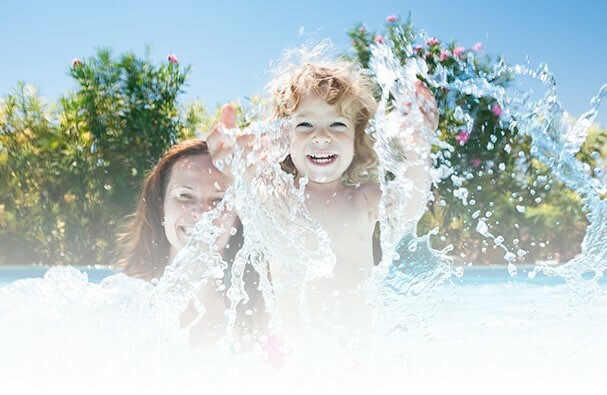 And when your hot tub is not in use, SmartClean schedules a two-hour filtration cycle twice per day. By integrating the filtration system with the spa’s primary high-flow dual-speed pump, ConstantClean filters more water per day than other brands, and does so in 1/10th of the time. In addition to filtration, all hot tubs require some form of sanitizer to kill microbes. To accomplish this, chlorine or bromine crystals may be added a few times per week or a sanitizing float can be used for three to four weeks. As an alternative, you may desire added convenience and a lower concentration of sanitizer chemicals in your water. If so, ConstantClean+ is the perfect solution. The plus (+) in ConstantClean+ adds two automated sanitation processes into the water management system: 1) ozonation with Mazzei injection, and 2) in-line sanitation. This turns a five-stage process into a nine-stage process. ConstantClean+ is standard on Signature Series hot tubs, and available as an optional upgrade on Vector 21 and Celebrity Elite hot tubs. Ozonation: Adding an ozonator with Mazzei injection supplements the workload of the in-line system, and is much more effective than UV light. Why not UV light? While ultraviolet light is one method of neutralizing bacteria, ozone is much more effective. In a UV system, water flows past a UV bulb very quickly. At best, this only disrupts the ability of bacteria to reproduce. UV bulbs also cloud up over time, further diminishing the quality of sanitation. In contrast, ozone (O3) permeates the water and destroys bacteria at the molecular level. Afterwards, O3 converts back into regular oxygen (O2). In-line sanitation: Adding in-line sanitation provides a dual-cartridge powerhouse. First, a mineral cartridge treats the water for up to four months. Second, a sanitizer cartridge gradually disperses bromine over the course of four to six weeks. On average, you can expect to change out the mineral cartridge three times per year, and the sanitizer cartridge once per month. 1. To remove surface contaminants such as body oils, lotions and skin cells, Vortex skimmers direct surface water into the filter cartridge(s) to trap contaminants and particulate. 2. To remove settled debris from the bottom of the spa, deep water is drawn up from the footwell through a safety suction fitting. 3. Water drawn into the safety suction fitting is forced upward through the filter cartridge(s) to trap debris, after which it mixes with filtered water from the surface skimmers, resulting in complete filtration from top to bottom. 4. Filtered water is drawn into the primary jet pump. 5. Water is immediately routed through the high-flow heater assembly. If the hot tub is equipped with ConstantClean+, the water now splits into two separate sanitation paths. 6. In the first path, the high-output, energy-efficient ozonator converts oxygen (O2) into activated ozone gas (O3). The Mazzei® injector mixes the ozone with filtered water. 7. Bacteria and other contaminants are oxidized before the O3 converts back into O2. This process destroys bacteria at the molecular level, dissolving its cellular structure and eradicating it. 8. Residual ozone and converted oxygen are reintroduced into the spa water through a dedicated fitting for maximum efficiency. Any remaining O3 converts back into O2. 9. In the second path, the dual-cartridge in-line sanitation system treats water with natural minerals and sanitizer before reentering the spa.